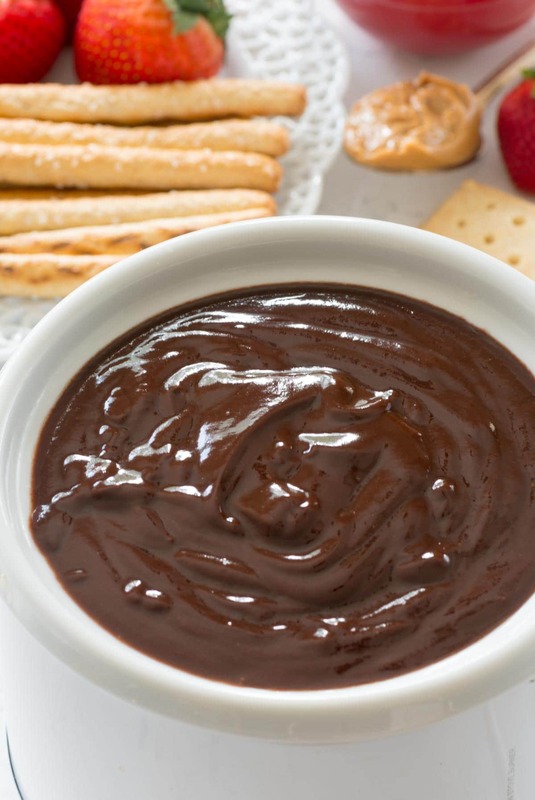 Peanut Butter Chocolate Fondue – this EASY fondue recipe has just 3 ingredients. 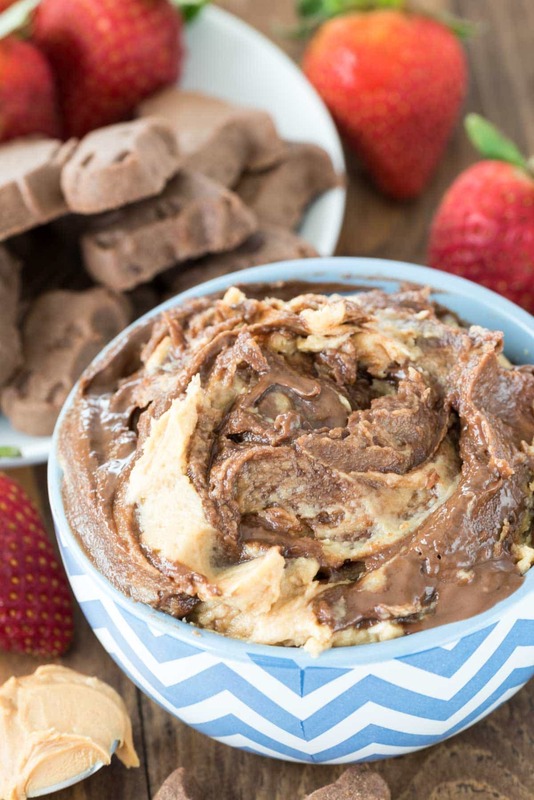 It’s full of peanut butter and chocolate and is a great party dip! Do you guys do fondue on New Year’s Eve? We used to, although it never had enough time to become a tradition. When Jordan was in first and second grade I’d make a gooey cheese fondue and we’d spend the evening dipping bread and drinking sparkling cider (for her) and champagne (for us). Then we’d watch a movie and celebrate at 9:00 with New York, then go to bed. In fourth and fifth grade, Jordan went to her cousin’s house for New Years Eve. Her cousin’s birthday is the 31st, so she got to celebrate two holidays at once. It was weird being alone on New Year’s Eve (childless) for the first time in years, but Mel and I managed to survive. We’d stay in, make appetizers, watch movies, and pass out way before midnight. Then, last year and this year, we’ve hosted a party, which is my favorite way to celebrate. I don’t like going anywhere on New Year’s…but I love hosting. (If I’m being honest, I’m a homebody and hate going anywhere ever, but hosting is a different story.) Last year we made tons of appetizers, which we’ll do again this year, but I’m also doing some fondue…CHOCOLATE fondue, that is. Have you ever been at an event with a chocolate fountain? OMG. We went to a wedding that had one once and I was filling coffee mugs with chocolate and drinking it. This peanut butter chocolate fondue is like that…you can totally dip things like cookies or pretzels or berries…but eating it with a spoon is pretty much the best way I like to eat it. With only 3 ingredients, this peanut butter chocolate fondue comes together in a snap. Just heat it up on the stove, melting the peanut butter, chocolate chips, and heavy whipping cream together until they are melted. You can also use the microwave if you want, or even a small slow cooker. In fact, I use a tiny crockpot that came with a bigger one. I think it’s meant to be like those baby cakes chocolate dipper pots; the ones you use to dip cake balls and truffles, but I use it for fondue all the time. On the stove or in the microwave, this comes together in literally minutes. Keep it warm, stirring it once in a while in your fondue pot while everyone goes nuts for chocolate. The big question is what you’ll dip Peanut Butter Chocolate Fondue in…or what you’ll use to drink it. Hmmm…add some vanilla vodka and you’ve got an amazing cocktail! 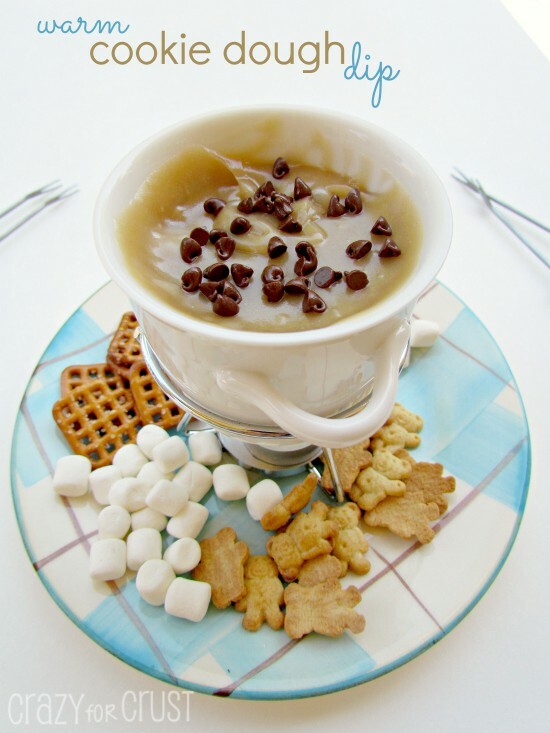 Peanut Butter Chocolate Fondue - this EASY fondue recipe has just 3 ingredients. 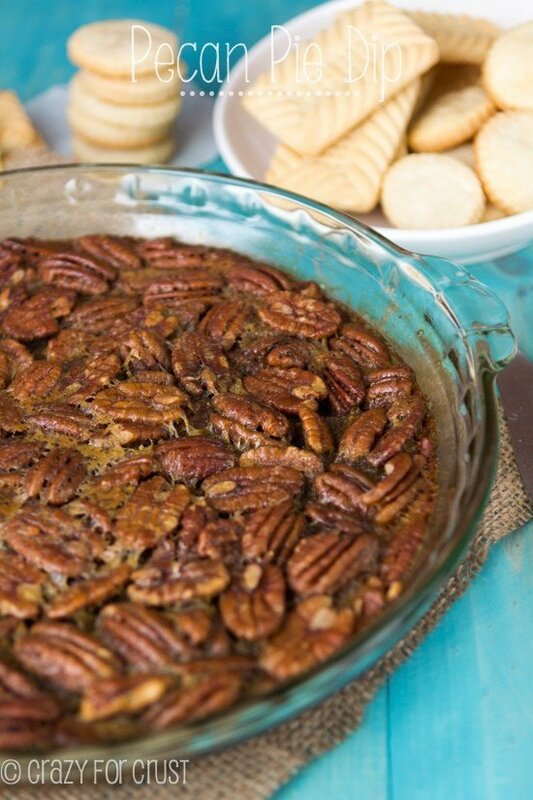 It's full of peanut butter and chocolate and is a great party dip! Stovetop: Add all three ingredients to a small saucepan. Heat over medium-low heat, stirring almost constantly, until melted and smooth. Pour into fondue pot. Microwave: place all three ingredients in a microwave safe bowl. Heat on high in 30 second increments, stirring between each, until melted and smooth. Pour into fondue pot. Serve with assorted dippers: fruit, crackers, cookies, or marshmallows. Have you ever been at an event with a chocolate fountain? OMG <— Yes the resort I stayed at over Thanksgiving in Puerto Vallarta, their Sunday brunch. It was epic and like no other chocolate fountain I've ever seen. I'm going back there for it! This looks insanely decadent. I want it for breakfast! Oh yum, what a great protein filled twist to a classic dessert dish! OMG – I just want to stick my face in this fondue! I went to a wedding once where they had a chocolate fountain. I wanted one at my wedding too, but $$$$ so we skipped it. I laughed really hard when I read that you filled a mug and drank the chocolate. 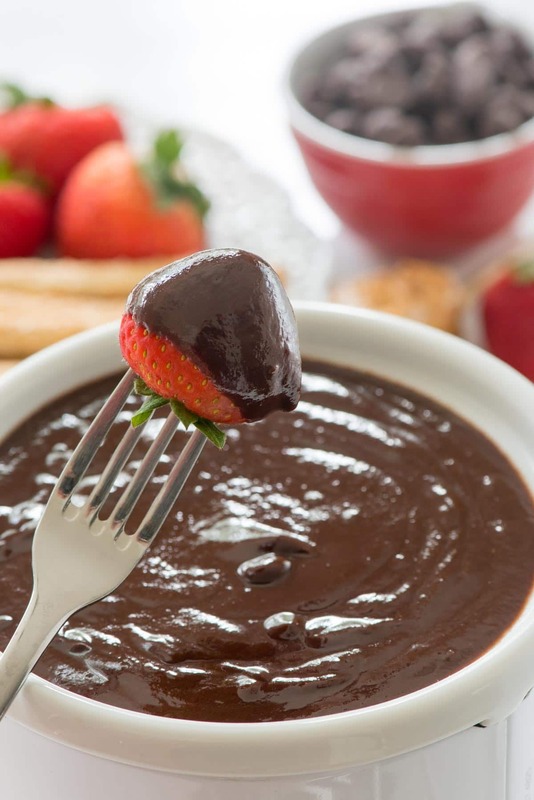 I’ve dipped way too many goodies in a chocolate fountain and this fondue sounds like it would be the way to go…YUM! Yup, this sounds about right. For any occasion! My mom has this big ol’ fondue pot that used to belong to my grandmother. I’ve never used it, but I might need to break it out for this! I made this exact thing for christmas eve dessert. So yummy! I have been heating up the leftovers and pouring over ice cream. SO RICH. SO CHOCOLATEY. I lurve this fondue!